Sophisticated manufacturers are beginning to see the benefits of outsourcing facilities management both outside and inside the yellow line. 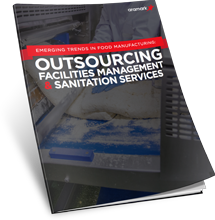 This new trend is improving operating environments and sanitation services, standardizing processes and reducing costs. Find out how you can remove the threat of failed audits and inspections, food recalls, hefty costs and a tarnished brand. Get the guide today.